We can give you at least ten reasons why every house should have a proper juicer, but allow us to mention only three. Cooking and processing food destroys micronutrients, juicing doesn’t. Health benefits of juicing are well-known – you can normalize conditions like high blood pressure, high cholesterol and diabetes simply by having at least four servings of fruit and vegetable juices a day. Juices are very low in calories, but high in nutrients. Obviously, in order to enjoy full benefits of fresh juices, having a proper juicer is in order. For that look no further than Breville JE98XL Juice Fountain. 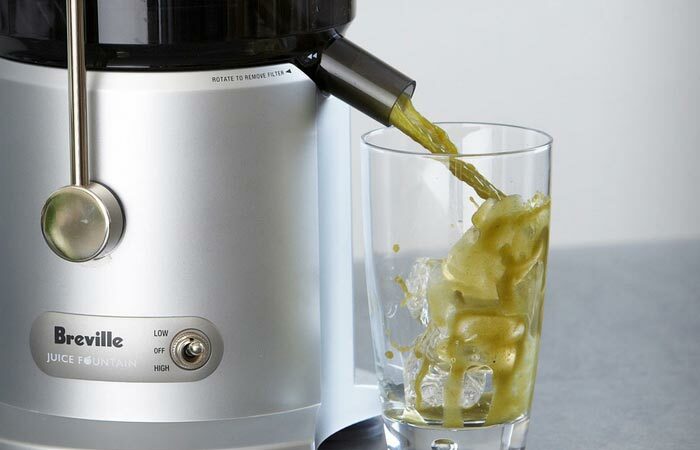 Thanks to its patented juicing system, Breville JE98XL Juice Fountain can extract more healthy nutrients than other juicers on the market while transferring less than 1.8F of heat which protects the enzymes found in fruits and vegetables and increases nutrient absorption. The juicer has a heavy-duty-850-watt motor which allows you to juice the hardest fruits and vegetables like apples and beats. Its highest speed is 12,000 RPM, while, for softer fruits and leafy vegetables like watermelon and spinach, you are advised to use the lower speed of 6,500 RPM. To illustrate how powerful this juicer is, we are just going to tell you that you can even juice pineapple with its rind on. Breville JE98XL Juice Fountain also has a wide 3-inch feeder chute which eliminates the need for chopping fruits and vegetables into smaller pieces. In order to ensure the best possible extraction, the juicer features a direct central feed system. The juice collecting jug has a froth separator and can take up to a litre of liquid. Breville JE98XL Juice Fountain also has a great safety feature called Safety Locking Arm which prevents you from using the juicer if you don’t lock its cover properly into the place. As far as the cleaning goes, do not fret. Although juicers are usually notoriously hard to clean, this juicer is completely the opposite. It is pulp-ejecting and most of its parts are dishwasher safe. Also, cleaning brush is included.